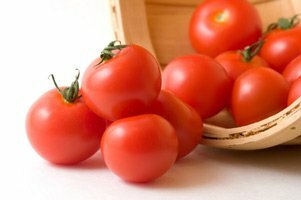 Somewhat larger than cherry tomatoes, Campari tomatoes are deep red, round, and about the size of a golf ball. It is a hybrid that is grown and marketed by commercial Canadian hothouses and shipped throughout North America. 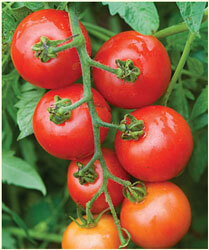 They are redder than most store-bought tomatoes because they are grown hydroponically and ripened on the vine. Because they are shipped with the vine still attached, they do not have to be ripened with ethylene gas. The Campari has a great taste, firm skin, and sweet flavor. They are sold in clamshell packaged clusters on the vine. Starting in 2012 you can now Buy Campari Tomatoes at Burpee! They named it the Mountain Magic Tomato and it is one of the most disease resistant tomatoes they have ever sold, and is highly resistant to early blight, late blight, and cracking. If you've been plagued by any of these problems you might want to give this variety a try.